From the subtlest to the grossest state, there are seven planes of existence. These planes are related to the seven kingdoms of nature. Three kingdoms are below the human kingdom and three kingdoms are above the human kingdom. Below us are the animal, plant, and mineral kingdoms; above us are the kingdoms of the planetary, solar and the cosmic devas. These devas express through our planet, through the solar system and through the cosmic system. In this image, these seven kingdoms are illustrated by symbolic representatives. The amethyst at the bottom represents the mineral kingdom. The violet crystal is surrounded by a sphere of green leaves and a pink lotus grows from out of its centre, both representing the plant kingdom. The leaves are surrounded by a blueish sphere. I generated it with photos of Venus and of a school of fish to illustrate the transition to the animal kingdom. This kingdom is represented by a group of coatis on a brownish sphere, for which I used colours of a photo of Mars. 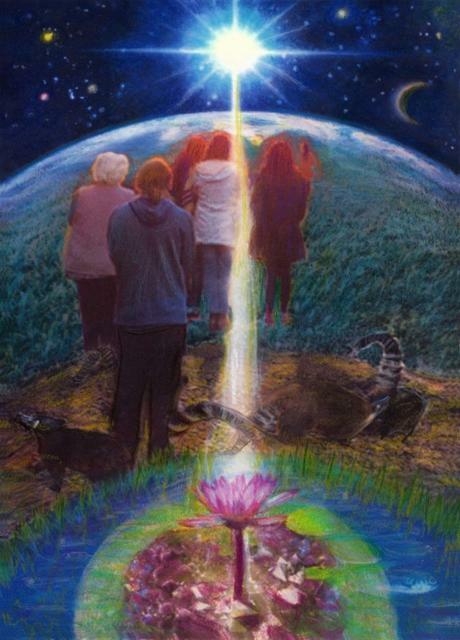 The group of people looking towards the Sun symbolizes the humanity aspiring for higher evolution. The three higher kingdoms are indicated by the sphere of the Earth, by the Sun surrounded by planets and by the stars in the background. A ray of light coming from the Sun illumines the path of the different kingdoms towards higher evolution. The different zodiacal signs are clustered in groups – you can see here all my Scorpio paintings.